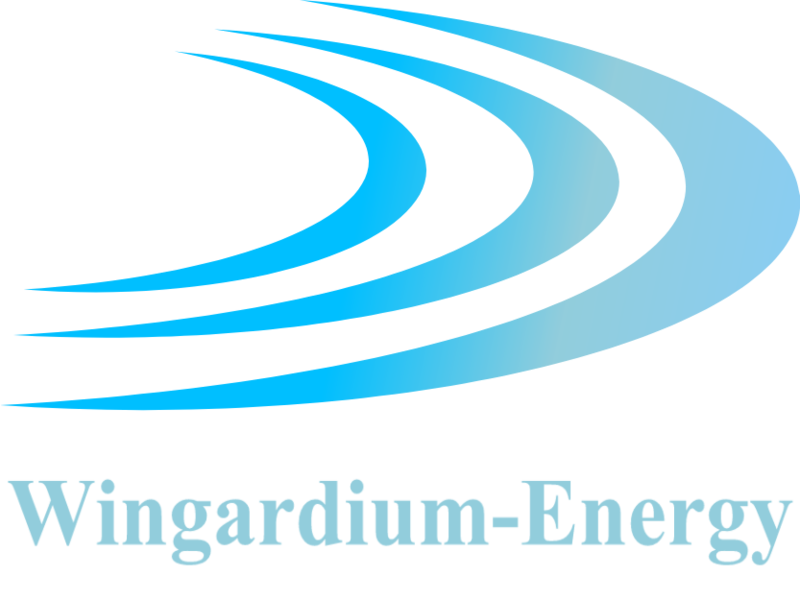 On a residential scale we advise against "everyone with their own turbine" and believe in the decentralised energy production on a neighbourhood scale. 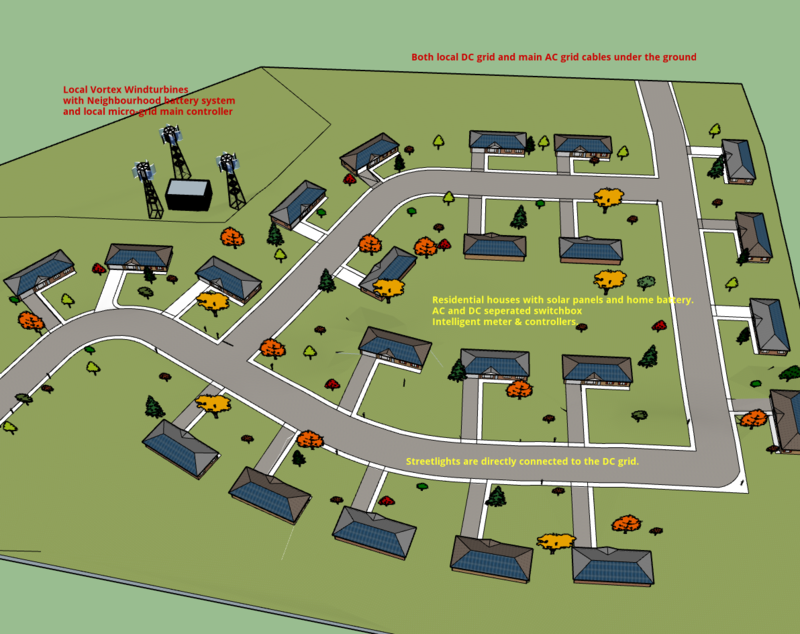 As shown on the concept image below we work with a hybrid powernet and a micro-grid system. One or more Vortex turbines generate wind-power while each house is equipped with solar-panels. 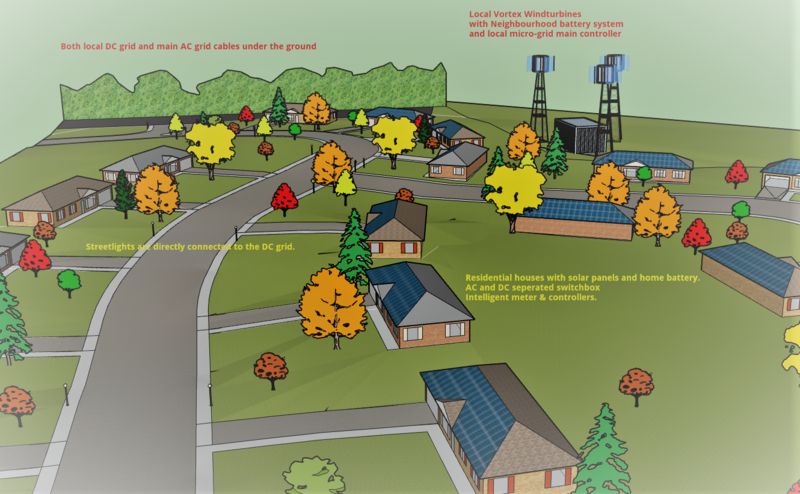 For energy storage there is a combination of a neighbourhood battery system and local home batteries. All alternative energy solutions are standard fitted with hybrid-inverters or also known as off-grid inverters. They have the advantage of being able to function without an AC power connection. They are more expensive then the on-grid inverters, but they allow you to function even during a black-out. For more information about micro-grids, please refer to our dedicated page. The Vortex Hive allows for maximum usage of roof space. A number of turbines and a construction are placed upon the roof. On this construction solar panels are placed. 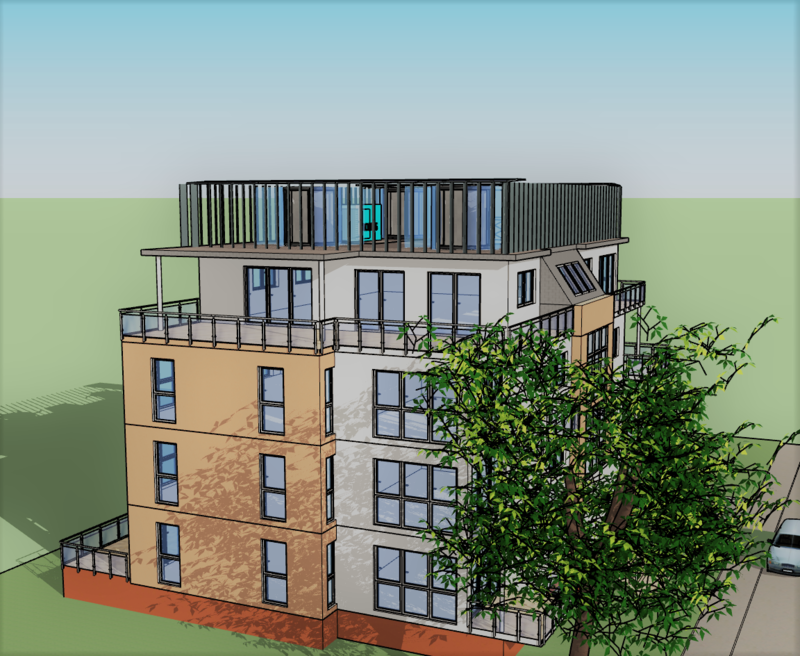 This enables us to combine wind and solar energy on a single roof. As an added bonus the space between turbines can be used as technical space for other building techniques. Finally fixed louvres are placed on the outside to shield the turbines from view, but still allow for a nearly normal wind flow on the roof. 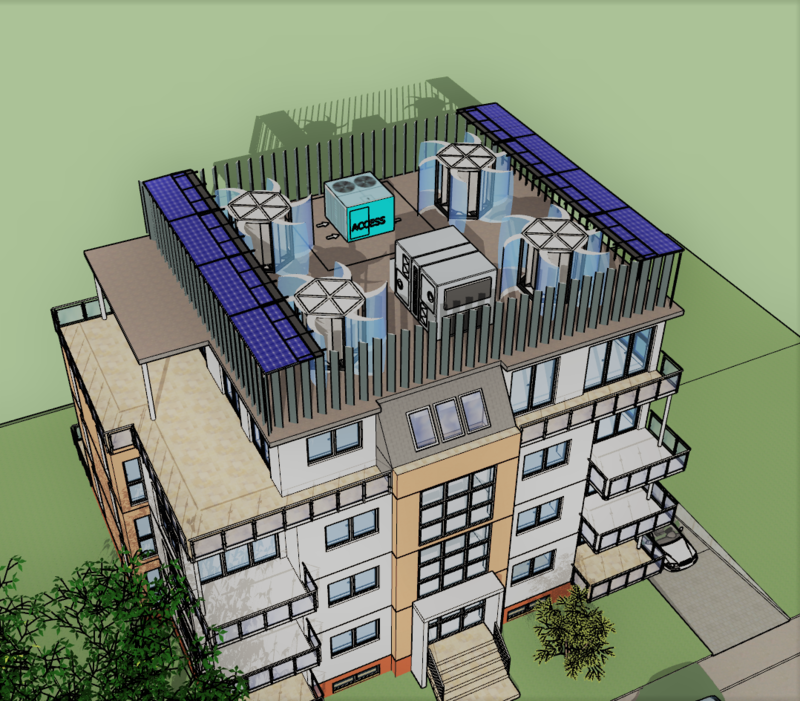 To make an optimum use of both solar and wind power we suggest combining any collective housing building to install batteries to store the green energy. 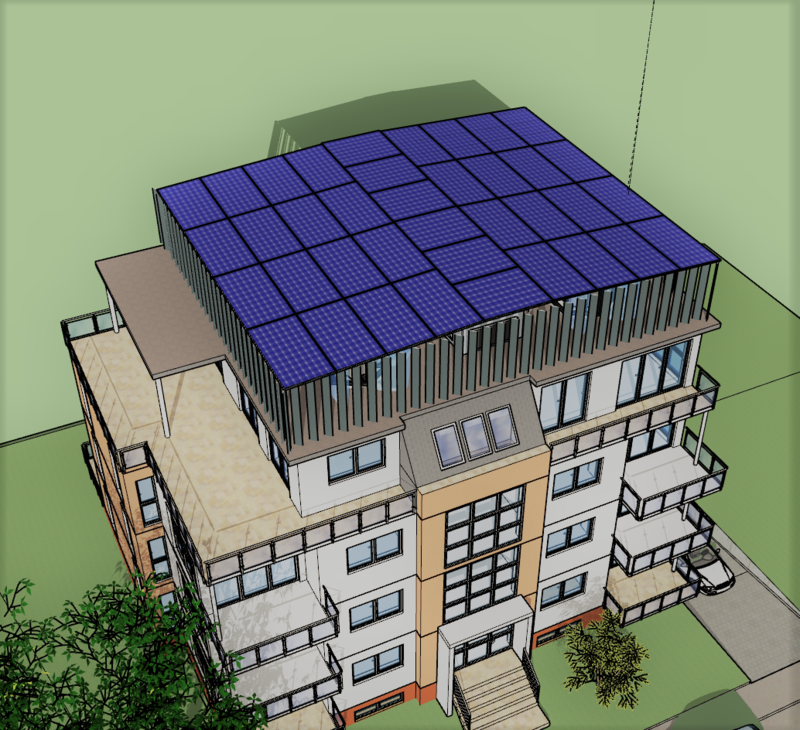 Essentially, we are creating a micro-grid inside one collective housing building.